“Thank goodness for Napolitano!” is the most recurrent and heart-felt phrase around these days. Berlusconi was head of the government; Napolitano is head of the nation. They are opposites. 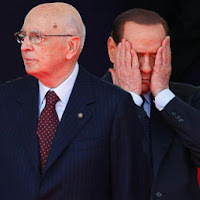 Giorgio Napolitano has a limited role and stays out of all government/parliamentary affairs unless a law violates the constitution or the prime minister no longer has a majority to support him. But he is a symbol of statesmanship and gentlemanliness even in the political arena. His behavior is always above reproach; his voice is always calm; what he says always makes sense. His choice of new prime minister, Mario Monti, is better than anyone ever elected. He is a man, while Berlusconi was a boy, a naughty disturbed boy. You may wonder how Berlusconi, this political freak, ever won elections. In our town everyone knows what a vote went for in the last election. The working class, or unemployed class that is, voted en masse for the highest bidder. Isn’t buying votes illegal? There are laws and then there is the enforcement of laws. Berlusconi went for the lowest common denominator, ignoring the thinking minority and gathering huge numbers from the slums. After all, there’s a satellite dish on every shack. He then did nothing for the poor, so they’d be there to vote for him again next time. Maybe you’ve seen crowds of flag waving, cheering supporters of Mr. B and wondered. They are brought in on busses and special trains from the countryside and paid, one professional fan admitted, to appear on TV. As if whatever happens on TV is real. Berlusconi, even last night, made a polished video announcement, not a real press conference where journalists might ask embarrassing questions. He has a large image-making staff, marketing experts, spin doctors, etc. They dress him up, comb his hair and tell him what to say, all very calculated for maximum effect on those who would buy anything from this confidence man. Deep down he’s a huckster, a TV salesman of miracle creams and vacuum cleaners. But he nearly ruined a beautiful country. He and his entourage of evil-doers remind me of Dante’s Inferno: The pagans wandering in limbo, carnal malefactors blown in violent storms, blind gluttons lying in the foul slush from ceaseless icy rains, the avaricious pushing enormous bags of money as punishment, the wrathful fighting and drowning, heretics trapped in flaming tombs, violent souls trapped in a river of boiling blood, suicides transformed into gnarled thorny bushes fed upon by harpies, blasphemers and usurers in a desert of flaming sand and fire raining from the sky, then the fraudulent, panderers and seducers marching in lines whipped by demons, flatterers steeped in human excrement, those who bought and sold blessings head-first in holes with flames burning their feet, sorcerers, astrologers and false prophets with their heads twisted backwards, corrupt politicians immersed in a lake of boiling pitch kept down by flying devils, hypocrites wearing lead cloaks they can never take off, thieves guarded by a fire-breathing dragon with snakes covering its back, evil counselors burning, sowers of discord hacked to pieces by demons, falsifiers afflicted by various diseases, traitors immersed in ice, and then at the very center of Hell is Satan, the giant, terrifying beast with three faces weeping, also trapped in ice, ignorant, impotent, full of hatred. Wow, if you knew the people who’ve been governing Italy for the past two decades you’d recognize them all in this Italian poem of 1300 a.d.
Next, my suggestions (to whom?) for social reforms (who am I?). And who’s listening? Mutt: Did you know that old academics never die, they just lose their faculties. Jeff: Old bankers never die, they just want to be a loan. Mutt: Old basketball players never die, they just go on dribbling. Mutt: Old bosses never die, much as you want them to. Jeff: Old chiropractors never die, they adjust. Mutt: Old composers never die, they decompose. Jeff: Old frogs never die, they just croak. 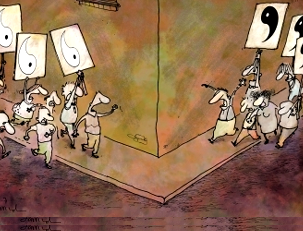 Mutt: Old grammarians never die, they just fall into a comma. Jeff: Which reminds me … Old English teachers never die, they just complete their sentences.